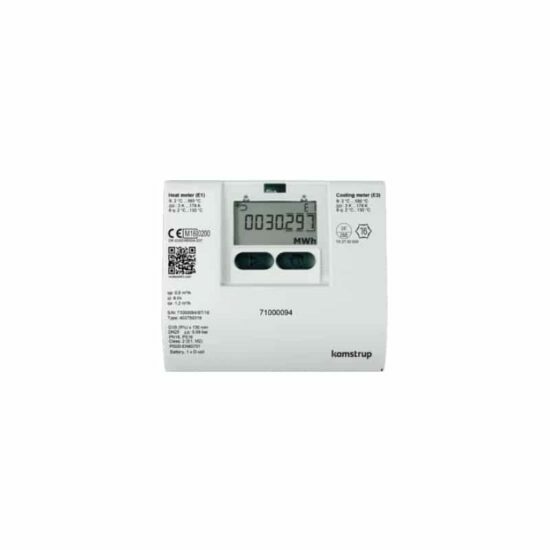 The meter is intended for energy measurement in almost all types of thermal installations where water is used as the energy-conveying medium. MULTICAL® 403 consists of a calculator, a low sensor and two temperature sensors. MULTICAL® 403 has been developed for measurement of energy consumption in lats, single-family and multi-family houses, housing associations, blocks of lats and small industry. The meter is simple to install, and it has a temperature range of 2 …180 °C and a meter programme with nominal low from qp 0.6 m³/h to 15 m³/h. Due to its robust design and high quality MULTICAL® 403 is practically maintenance free, and its simple set-up makes it easy to conigure via the meter’s front keys. MULTICAL® 403 has been optimised compared to earlier generations. The total dynamic range has been increased to 1600:1 from saturation to start up and the meter has an approved dynamic range of 250:1. It is thereby secured that every conceivable consumption is measured with the same well-known Kamstrup precision. The meter can be powered by mains or battery supply as required. You can choose between a small battery without transport restrictions or a more powerful battery with 16 years’ lifetime. No matter which solution you choose the power consumption of MULTICAL® 403 is low. Accumulated heat energy and/or cooling energy can be displayed in kWh, MWh or GJ, all in the form of seven or eight signiicant digits. The display has been specially designed with a view to obtaining longevity. A wide range of parameters are conigurable via the front keys of MULTICAL® 403: Flow sensor position in inlet or outlet, energy unit, primary M-Bus address, radio on/off, target dates etc. Coniguration can be carried out on site, thus contributing to a reduction of stocks and installation time. MULTICAL® 403 is available with communication modules for Wireless M-Bus, M-Bus and RS232. The modules are available with either pulse inputs or pulse outputs. In addition to reading current values, the programmable data loggers of MULTICAL® 403 can be read via M-Bus. Looking to make your heat meter a smart prepayment meter?